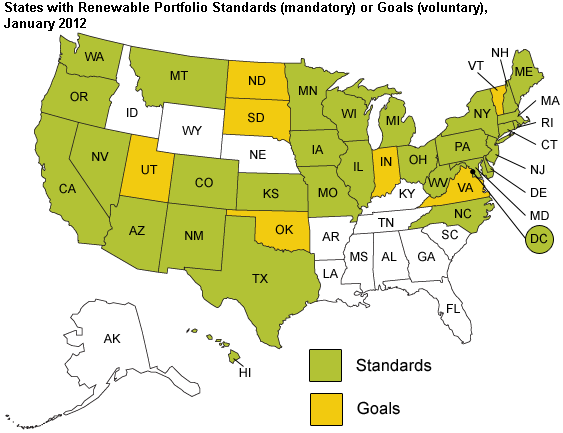 Note: The map includes West Virginia as a State with a Renewable Portfolio Standard, although the Interstate Renewable Energy Council categorizes it as a goal State rather than an RPS State. Renewable portfolio standards (RPS), also referred to as renewable electricity standards (RES), are policies designed to increase generation of electricity from renewable resources. These policies require or encourage electricity producers within a given jurisdiction to supply a certain minimum share of their electricity from designated renewable resources. Generally, these resources include wind, solar, geothermal, biomass, and some types of hydroelectricity, but may include other resources such as landfill gas, municipal solid waste, and tidal energy. Although several RPS proposals have advanced part way through the U.S. Congress in recent years, there is currently no RPS program in place at the National level. However, 30 States and the District of Columbia had enforceable RPS or other mandated renewable capacity policies, as of January 2012. In addition, seven States had voluntary goals for renewable generation. These programs vary widely in terms of program structure, enforcement mechanisms, size, and application. In California, for example, an RPS of 20% of retail sales was originally enacted in 2002. As of April 2011, the RPS requires California's electric utilities to derive 33% of their retail sales from eligible renewable energy resources in 2020. The law also established interim targets of 20% by the end of 2013, and 25% by the end of 2016. Another common feature of many State policies is a renewable electricity credit (REC) trading system structured to minimize the costs of compliance. Under these policies, a producer who generates more renewable electricity than required to meet its own RPS obligation may either trade or sell RECs to other electricity suppliers who may not have enough RPS-eligible renewable electricity to meet their own RPS requirement. In some cases, a State will make a certain number of credits available for sale. Such a system accommodates timing differences associated with planning and construction of new generation. Only one entity—the generator or the REC holder—may take credit for the renewable attribute of generation from RPS-eligible sources. An RPS is one policy mechanism to encourage development of renewable energy. States with RPS policies have seen an increase in the amount of electricity generated from eligible renewable resources. At the same time, other States without RPS policies have also seen significant increases in renewable generation over the past few years resulting from a combination of Federal incentives, State programs, and market conditions. Increases in renewable generation have been driven by the availability of Federal tax incentives, as well as by State RPS policies.